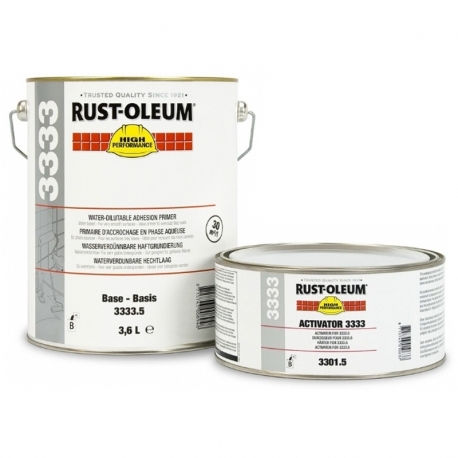 Rust-Oleum 3333 Super Adhesion Primer provides excellent adhesion on non-porous, dense mineral substrates like tiles or power floated concrete as well as non-ferrous metals like stainless steel, aluminium or new hot-dip galvanized steel and thermosetting plastics like fibreglass-reinforced polyester or epoxy. 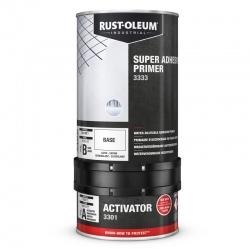 Rust-Oleum 3333 Super Adhesive Primer Resists light to moderate abrasion, intermittent high humidity and moisture, regular chemical cleaning and spillage of chemicals if recoated with the appropriate Rust-Oleum system. 3333 Super Adhesive Primer can be recoated with nearly all Rust-Oleum Epoxy, Polyurethane, Chlorinated Rubber/Vinyl and Acrylic coatings. It is also classified Class 1 Surface Spread of Flame according BS 476; part 7: 1987. 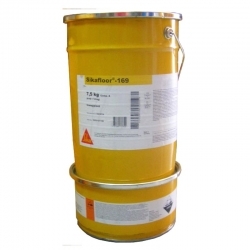 Remove grease, oil and all other surface contaminations with Rust-Oleum FK111 Cleaning Solution or by alkaline or high pressure (steam) cleaning. 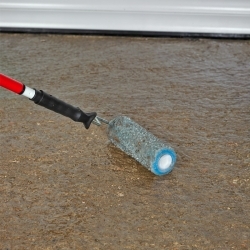 New concrete should cure and dry for at least 30 days prior to the application of the coatings. 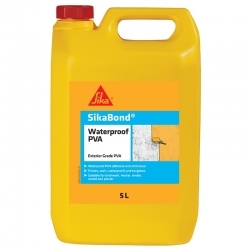 The surface must be clean and may be slightly damp during application. Stir individual components thoroughly before mixing them together. Use the boxing method or a low speed mixer. 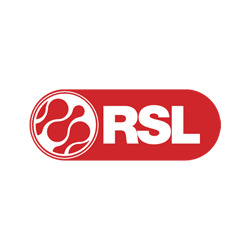 Temperature of air and substrate between 10 and 35°C and relative humidity below 70%. The substrate temperature must be at least 5°C above dew point. 5 up to 10 vol. % with water. Use brushes based on a mixture of synthetic/natural bristles. Check wet film thickness, avoid excessive film thickness. Preferably use disposable brushes. 10 up to 20 vol. % with water. Use short nap (4-6mm) mohair or velvet brush rollers. Check wet film thickness, avoid excessive film thickness. Preferably use disposable rollers. Up to 20 vol. % with water. Spray: Gravity cup and pressure cup. Tip size: 1.2 -2.0 mm. Atomizing pressure: 2 - 4 bar. Check wet film thickness, avoid excessive film thickness. Immediately after application with (hot) water and soap. Maximum dry film thickness per coat: 30 μm dry, equals 50 μm wet. If the relative humidity is high during drying, curing might be retarded. Our best recommendation for this would be to remove all existing coatings and try a test area with Rust-Oleum 4900 Polycoat 2K to ensure it is suitable before coating the whole area. There is no difference between the products, the Handy Pack has been developed to make one off smaller projects easier with more user friendly packaging and instructions. 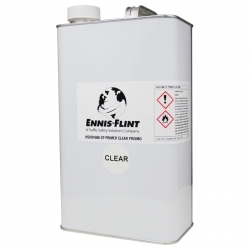 Ennis-Flint CP Primer is a high quality, thin solvent based resin solution for priming concrete surfaces, used to improve adhesion between concrete and surface materials, e.g. 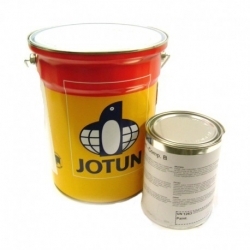 hot melt bituminous compounds, thermoplastic or epoxy resin. 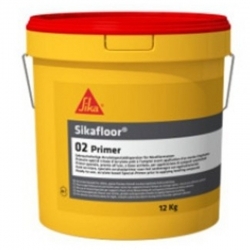 Sikafloor 169 is 2-part, very low yellowing, low viscous, transparent epoxy resin binder for mortars, screeds and seal coats like Sika CompactFloor and Sika Decofloor. 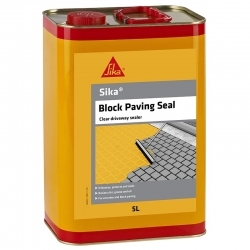 A clear, alkyd sealer for use underneath Blackfriar Professional Paints on porous surfaces. 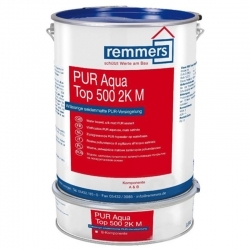 Rust-Oleum 5130 Primer DSP is a super-high solids two pack epoxy resin primer designed for the suppression of vapour pressure effects. SCHÖNOX SHP is a solvent free, 1-component special acrylate dispersion primer for interior applications. 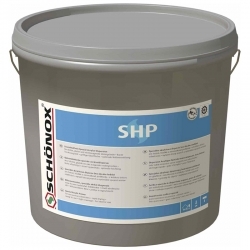 SCHÖNOX SHP is a special primer for sound, smooth and non-absorbent substrates. Especially suitable for laying on old vinyl, linoleum and rubber coverings. 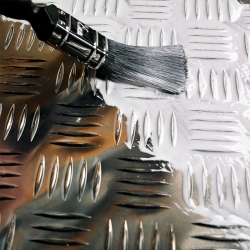 With short waiting times and easy roller application, this product provides optimum adhesion. 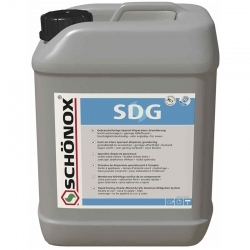 SCHÖNOX SDG is a very low emission special dispersion primer ready for use, suitable for the fast pre-treatment of unheated cementitious screeds with increased residual moisture up to 4.0 CM-% (85%-rh). 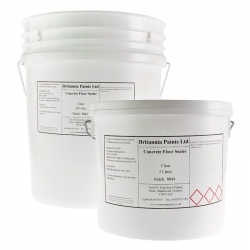 A water-based epoxy, anti-corrosive primer designed for the protection of steelwork prior to application of our epoxy floor coatings.